Frank Hider was born in 1861. Censuses vary as to his place of birth, citing Newington, London, Old Kent Road, London and Walworth, Middlesex. His father, George Hider, married Frank's mother, Jane Cansick (1828-1871) on 29 October 1857 in Kennington, London. George married Henrietta Maria Mackie in 1871. In the 1881 census, when living in Croydon, Surrey, the surname was spelt as Heder. He married Laura Anna Hill in 1885 and they had several children, one of whom, Christopher George Hider, also studied art. Frank Hider studied at Heatherleys Art School. He travelled through Britain painting rural landscapes and coastal scenes in both oils and watercolours. Hider also visited Italy and Belgium and, although a prolific painter, he rarely exhibited. He became part of the Burnham Beeches colony of painters in Buckinghamshire. His style was similar to that of S Y Johnson, although done in a broader stroke. His oils were often inscribed with the title and location on the reverse. 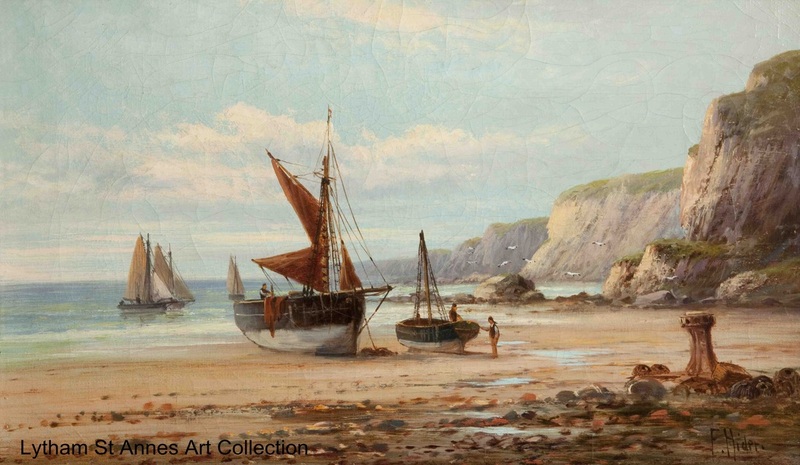 Typical titles were Off the Cornish Coast, Bringing in the Catch and Seagulls Haunt. His work is sold regularly in Christies and other top auction houses. The signature M C Hider is thought to be a pseudonym. 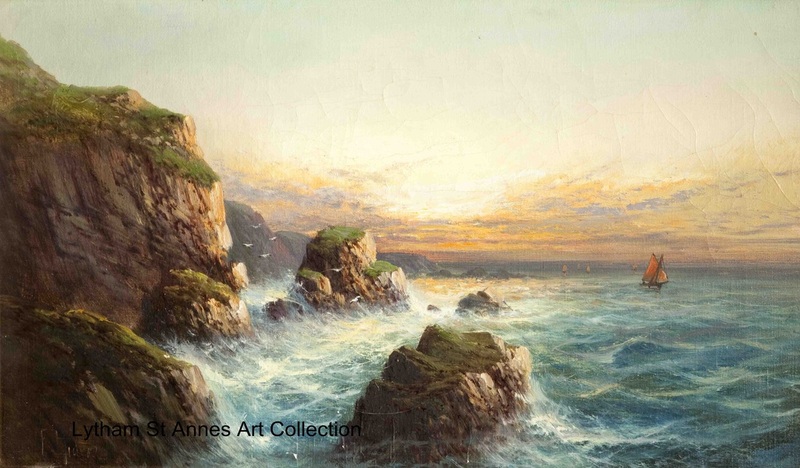 The drama of this exciting seascape by Frank Hider is enhanced by the strong dynamic line running down from the cliff top on the left, past the rock with the seagulls and down into the sea, roughly in the centre of the picture. This carries the eye deep into the foamy sea smashing against the rocks. We are set further off kilter by the other strong dynamic line which takes us through the channel on the left between the rocks all the way to the distant horizon, allowing elements of the shallow picture plane to interact with those of the deep picture plane. Although the artist uses a quite representational style, the gestural brushwork and lavish use of white is a strong pictorial force within the image, exaggerating the movement of light and the textural feel of the surface of the water as well as the rocks rising out of the sea. The cold blues and whites of the sea contrast sharply with the warm reds and browns of the rocks topped with greens and ochres, the whole scene being warmed by the gold of the distant sunset lighting up the sky and reflecting into the water which is the focal point of the painting. was studying at Bangor College. Charles Snelson married Annie Longworth (1874-1961) in 1900; their daughter, Winifred, was born in 1902. On the 1911 census his occupation was given as a headteacher, living in Thornton Hough, Chester. His address on the 1939 register was 26 St Martins Road, Blackpool. When Charles died in 1960 his address was 3 Fairhaven Road, Lytham St Annes. He also donated the oval, oil on canvas painting, A Bridge Near Llangollen, by H Elliot.